DATE AND TIME: 08:45 for 09:00 on Saturday 29th October 2016. Our outing this month is to Worcester, where Julian Kritzinger will lead us on a tour around the town explaining the history of the buildings and the families as we go along. We will meet at 9am at the Teacup Tea Garden, 21 Baring Street. Worcester. The tea garden opens at 8.15am, so there will be time for a cuppa if you arrive early. Allow 90 minutes for the trip from Cape Town. From the N1 take the R43 exit (which is just before one sees the multi-gabled Golden Valley casino…) and turn to your right. This is Rabie Street. Continue along Rabie Street, over the railway line. 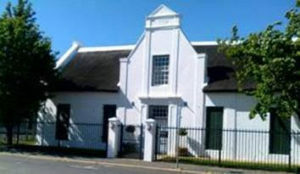 You will see Tulbagh Street, then the following street is Church Street (Kerk Str). Turn left into Church Street. 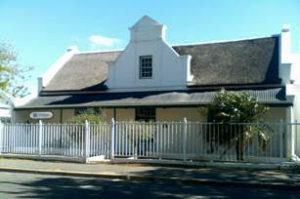 The fourth street from Rabie Street is Baring Street. Turn right into Baring and you will see the Teacup Restaurant there, on the corner. Julian led us on our very successful away-weekend to the Nuy Valley last year and he is keen to tell us his stories about families and buildings in the town, many of them connected to the farms we saw in the Nuy Valley. The tour will in include walking and driving. Julian is a formidable young man. He has made a study of families in the Worcester area, particularly the Rabies, of which he is a member; he is waiting for the results of two PhD’s on law which he did simultaneously; and he has just won a DA seat in the local elections with 94% of the vote in his constituency, having personally visited every one of the over 3000 houses in his area! Julian has suggested lunch at the Cafe Hugo. If you intend to have lunch at the Hugo Cafe, you must let Pat Kramer know by the 12 October as we want to book. You could, of course, have a snack elsewhere (last year’s place, the Barn was good). NB: VASSA outings are for paying VASSA members only!